Need 100 Amazon Bucks? 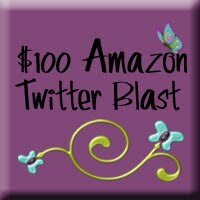 Enter the Twitter Blast Here! Are you looking for $100 in Amazon Gift Codes? I've teamed up with Makobi Scribe to bring you this awesome giveaway. Isn't she so generous!? Enter to win using the (new) Rafflecopter form below. The more Twitter users you follow, the more entries you get! Because there are so many blogs to follow on Twitter, there is a bonus at the end of the Rafflecopter form! The list will also be rotating throughout the week so that different blogs will have their chance at the top of the list. The giveaway is open to Jan 1.